Save $100 per person if booked 4 months in advance to enjoy a 13-night stay and explore the classic sights of South Africa! SOUTH AFRICA LAND & DOMESTIC AIR COSTS: $4380 CAD - $4645 CAD * per person sharing. VALIDITY: December 1, 2018 - October 10, 2019 * (Depending on seasonality, departure, location and number of travellers). ACT NOW! OFFER ENDS OCTOBER 10, 2019! On arrival in Johannesburg at OR Tambo International Airport, you’ll be met by your representative and transferred to your hotel. Johannesburg is the largest and most populous city in South Africa. It is also the source of a large-scale gold and diamond trade, due to its location on the mineral-rich Witwatersrand range of hills. The remainder of the day is at leisure & unescorted. Why not enjoy a sightseeing tour or simply relax at your hotel. At 19h00 we will meet up at reception for a briefing on the tour and a chance to meet fellow travellers. Depart Johannesburg after breakfast and head for Pretoria, South Africa’s capital city, for a short orientation tour, before continuing to the Mpumalanga Province, known as “Paradise Country”. Dropping several hundred feet into the lush subtropical region of the Lowveld, we travel via the historic towns of Dullstroom and Lydenburg. After traversing the famous Long Tom Pass, we travel via Sabie and arrive late afternoon at your hotel. After an early morning breakfast, we’ll drive along the spectacular “Panorama Route”, offering views of amazing scenery including the 26 kilometre-long Blyde River Canyon (home to the Three Rondavels), Bourke’s Luck Potholes’ and historic God’s Window, a breathtaking view (weather permitting) at the edge of the escarpment taking in the Kruger National Park. We arrive back in Hazyview in the early afternoon, where the remainder of the day is at leisure to relax or join an afternoon game experience (optional and for own account). The day begins with early morning coffee or tea, followed by a thrilling open vehicle safari (with English speaking game ranger) in the Kruger National Park with pre-packed breakfast. 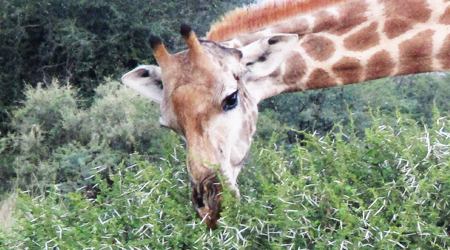 Kruger is one of the world’s greatest national parks, home to a stunning array of wildlife. Search for the ‘Big Five’ (rhino, buffalo, lion, leopard, and elephant) as well as prolific birdlife and numerous other game. 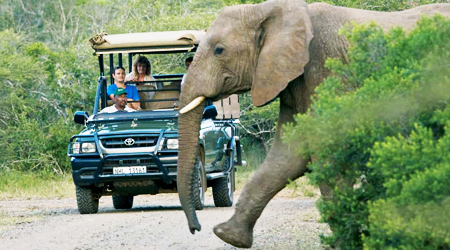 The afternoon is at leisure and later, enjoy another open vehicle game drive in the Kruger National Park. During your game drive you may get to see a variety of antelope, bird species as well as elephant, rhino, lion, buffalo, zebra, giraffe and more! Return to your lodge after the open vehicle game drive. This morning, after breakfast, we travel to Swaziland, an independent Kingdom within the borders of South Africa, known for its lovely scenery, crafts and colourful indigenous culture. An interactive cultural experience introduces us to the charming people of Swaziland and their traditions. We travel via the capital city, Mbabane, and on to the beautiful Ezulwini Valley for a true African shopping experience at the Ezulwini Craft Market which is packed with woven baskets, beadwork and carvings. After breakfast we will continue south through Swaziland, before re-entering South Africa. Travel into Zululand, passing traditional huts and endless vistas. 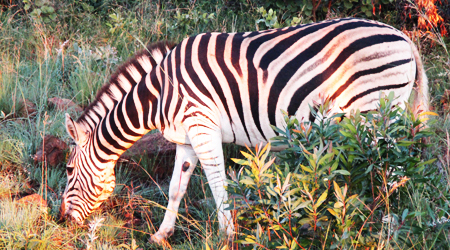 This afternoon enjoy an open vehicle safari with an English speaking game ranger in the Hluhluwe-Imfolozi Game Reserve, which contains an immense diversity of fauna and flora and is particularly famous for its conservation of black and white rhino. 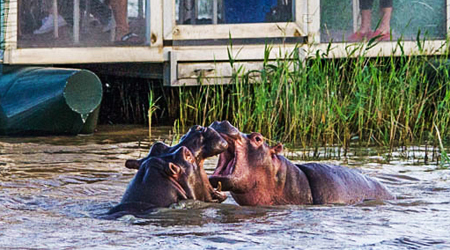 It is the oldest proclaimed nature reserve in Africa. It consists of 960 km² (96,000 ha) of hilly topography and is known for its rich wildlife and conservation efforts. 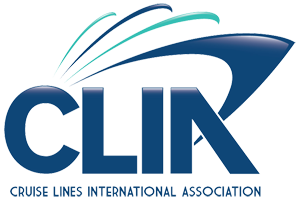 This morning, after breakfast, we will join a cruise on Lake St Lucia (depending on favourable weather conditions). Beautiful scenery and the possibility of seeing some hippos! Later, depart for Durban. Our journey takes us past traditional Zulu Kraals, Eucalyptus plantations and sugar cane fields. We arrive early afternoon and the remainder of the day is at leisure to enjoy the golden beaches of the Indian Ocean. After breakfast, transfer to Durban airport for the short southward flight to Port Elizabeth, where we will be met by our representative and once everyone has arrived, we set off to explore the magnificent beauty of the indigenous Tsitsikamma Forest. Visit the spectacularly beautiful Tsitsikamma National Park and Storms River Mouth (weather permitting). We’ll arrive at our hotel in Knysna, known as the oyster box of South Africa, nestling on the banks of a beautiful lagoon in the heart of the Garden Route. After a leisurely breakfast we’ll enjoy a lagoon cruise to the Featherbed Nature Reserve (weather permitting), where we can take a trailer ride to the top of the Western Head to enjoy panoramic views of the town and lagoon, returning for lunch. After breakfast, travel over the Outeniqua Mountain Pass to Oudtshoorn, known as the “ostrich capital” and the centre of the world’s Ostrich farming industry. We’ll visit an Ostrich Farm for a guided tour and light lunch, before taking a tour of the spectacular limestone caverns of the Cango Caves, one of the world’s great natural wonders, sculpted by nature through the ages. We will arrive at our hotel in the late afternoon, in time to check in and relax before dinner (for own account). This morning you participate in a very unique experience - an early morning Meerkat Safari. Witness these incredible wild habituated creatures emerging out of their burrows, in time to soak up the sun before they head about their daily activities (weather permitting). After this thrilling experience, head back for a delicious breakfast. After breakfast, the journey continues through the ‘Little Karoo’ to Barrydale, where you will have the opportunity to visit a local farm school, interact with the children and teachers, spending time with them in the classroom learning more about the local farming community, before travelling to Montagu, a picturesque and historic spa town. (The school visit is subject to the school being open). Continue to Cape Town, spectacularly set at the foot of Table Mountain. This morning you are met for a tour of Cape Town City and a visit to Table Mountain. Travel by cable car to the top of Table Mountain where you can enjoy spectacular views of the city and peninsula. After the visit the tour continues through the Malay Quarter, the city centre and Company Gardens. View the Castle of Good Hope. Return to your hotel for an afternoon at leisure. This evening you are treated to a taste of delicious Cape food, captivating theatre and entertaining tales and songs about the people of the Cape. Enjoy a full day tour of the Cape Peninsula, offering some of the most spectacular coastal scenery in the world. Drive through Sea Point, the seaside village of Hout Bay (where you can enjoy an optional and for own account seal island boat cruise) and then on to Cape Point where (by tradition) it is said that the Atlantic and Indian Oceans meet. We'll return to Cape Town by way of Simon's Town, where we visit the Penguin colony at Boulders Beach. Enjoy some last minute shopping (unescorted) or sightseeing (own account). Later you will be transferred to the airport, harbour or railway station for your onward journey. 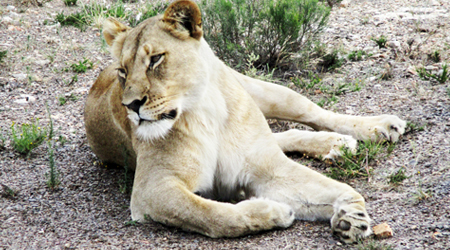 Interested in Save $100 Per Person - Classic South Africa with Tourcan Vacations?